Early on in your baby’s life, you learn to decipher their cries. They cry for a lot of reasons, pain, hunger, boredom, discomfort, even just because they feel like it. When a baby cries it’s always because they are trying to communicate something to you, and after a while, you can start to notice patterns and figure out what it is they may want. When babies become toddlers through a new cry emerges, the fake one. It doesn’t take too long to figure out if a toddler is really crying or faking it for attention, but the path after that can be a little tricky. 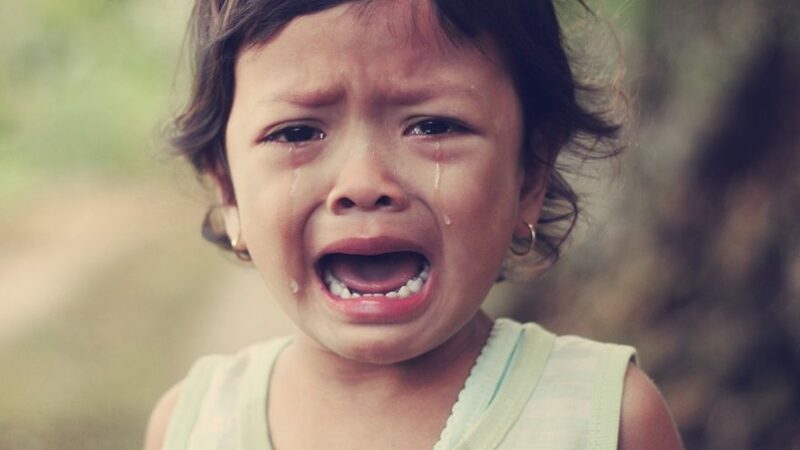 What do you do when a toddler is fake crying and how can you get them to stop it? First, you’ll have to figure out why they are fake crying. Has it worked in the past for them? Did they figure out that fake crying could get them attention or other rewards? It can be tempting to give in just to get some peace and quiet but the more you do the deeper the problem will become. Some children learn early that being hurt can get them a shower of hugs and attention. Doling out bandages to quell a real ouchie even though it doesn’t need one can be okay in a pinch, but if your child really isn’t hurt at all, that’s a different situation. A toddler that throws himself to the ground and cries “owwie!” may be doing it for attention. Other children have figured out that causing a scene is a great way to get what they want. A child who fake cries when told “no” at the store is only steps from getting into tantrum territory and while tantrums and outbursts can be a sign of a frustrated child without the skills to handle such big emotions, it can also be a sign of a child who is trying to game the system. It’s up to you to figure out which is going on and respond correctly. A fake crying toddler is still trying to communicate with you, so help them find a better way to do it. Many parenting blogs advise that you should get down on the floor with them and cry too to try to embarrass or confuse them, but this approach doesn’t teach them not to do it. In fact, it can backfire and become a way for them to get the attention they’re seeking by fake crying more. While it’s probably not helpful to call them on it either, as you may make a mistake one day and be snarky at an actually crying child. While it can be tempting to just ignore it and hope your child gets the message, it’s not really likely that they will, especially if they are only 2 or 3 years old. Passive aggressive behaviors just don’t work on toddlers and besides, you don’t want to introduce that dynamic into your relationship later, remember they learn from you. It is helpful to model the behavior you want. When you see your child start to spiral into a fit of crying, head it off at the first sign. Be gentle, use your words. Show your child that they can trust you to be kind. Talk to your child, say “I know you are frustrated but I need you to talk to me.” Make it clear that fake crying won’t get your hackles up and that you just need them to use their words. Reassuring them that you will give a hug or a high five when they need it and that all they need to do is ask is a great first step in opening the lines of communication. It can be hard to feel like you’re in a standoff with your toddler. They want a cookie, you don’t want them to have one. They ask you decline. They begin to fake cry. It’s not as simple as just saying “no” because they will not always back down, especially if pushing the envelope has ever worked in the past. Giving choices of appropriate behavior can be helpful here. “You can’t have a cookie, but you can have a water or some cheese, would you like either of those?” gives your toddler an out and if they refuse that’s on them. You made your concession, it’s time for them to pony up. Make sure you let your partner, family, and other caretakers know the plan. It can feel like one step forward and two steps back if other adults in your toddler’s life are making the mistake of doting on a fake cryer or giving in to demands or even just ignoring them or invalidating their feelings. It’s a much smoother road if all adults in the child’s life are on the same page and respond the same way. Reinforcing these lessons are the only way they work. It’s never easy being a parent, and each child is different. You may make some mistakes. Frustration, being over-tired, and just feeling the stress of life not only affect your toddler, but they also affect you too. If you make a mistake and it’s possible or beneficial to apologize, do so. If it will only make things worse, take some time to re-center and then do better next time. Nobody is perfect, not you and not your toddler. Practice forgiveness towards them and eventually, they’ll learn to reciprocate. Sussing out when crying is real or fake is hard at times, and so being cautious and paying attention to what is happening before, during and after can help you better inform your choices for reactions. Remember that raising a child is a long road and each bump in that road is an opportunity to show love and kindness. Be a trusted person and your child will eventually grow to trust you and treat you with respect and kindness back.